I think that there were two main problems with the convention, and the first was the venue and location. There’s one thing that can be said about the Gaylord Resort and Convention Center, and that is it is nice. And… perhaps a little too nice for an anime convention. The venue pretty much felt more like a shopping mall than a convention hall, complete with upper class clothing boutiques and glassware shops. And the weird thing is that these shops remained open through out the entire convention. Now, the fans that attend these events tend not to be that well off as far as money goes. They often have to travel in large groups, and then they squeeze a ridiculous amount of people into a single hotel room in order to cut costs, provided they can even afford that in the first place. 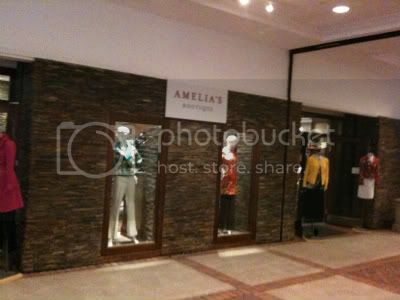 So they couldn’t really afford the boutique shops, which remained deserted all weekend long. But what’s worst is that they could not afford food, and food is kind of important when you’re away for the entire weekend. There were no fast food nor any chain restaurants in the entire venue or neighboring areas. An onsite catering service served sandwiches and hot dogs, but they closed around noon every day, so it was useless and unreliable. The only places that con goers were able to eat at were high class restaurants, which were far too sophisticated in both atmosphere and price. Why should our only food options be filet mignon or lobster when all we want to do is eat for the weekend?! Now, one service I thought was actually really well done was the Katsucon’s staff-run coat and bag check. Drop off your coat and bags, grab a ticket, and come back when you’re done to pick it up. They were even open until 4:00 am so that you could actually enjoy in late-night activities without worrying about your stuff. That is, until I went to drop my suitcase off after we checked out of our hotel Sunday morning. That’s when the Gaylord screw job struck again. “Sorry, you can’t drop your luggage here, ” the volunteer informed me as she took my coat. Wait, what? But this is the bag check, right? 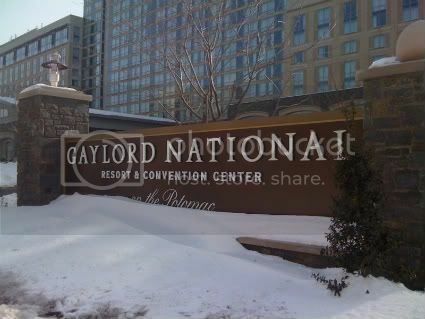 But I didn’t stay at the Gaylord. This isn’t my hotel. “… sorry,” she said in the most sympathetic way possible. Great. Just great. I even went to the press ops office to drop off my heavy bag, but they told me that they didn’t want to be held responsible for it, so no dice. The only folks willing to help me were the staff members of FUNimation, who told me they had plenty of room in their dealer’s room booth for me to keep my bag there until the con was over. If it wasn’t for them, I would have been rolling around my huge suitcase all over the con floor that final day. It was a pretty venue, but it was not a venue that catered to the otaku masses. We were totally out of place, and I’m sure the poor bastards sharing the con center with us that weekend felt the same way as well. So the second major issue with Katsucon was in its organization, or rather, the lack thereof. Because they stopped con catering Saturday afternoon and all the neighboring restaurants were way too expensive, I had no choice but to go to the Katsucon maid cafe for my Saturday night dinner. Now I’ll be honest, I’m far too shy to actually go to a maid cafe. I can barely keep a idle conversation going with a regular waiter, so you can imagine my horror of having to deal with a waitress that is supposed to be engaging with you. So while I’m Mr. Moé and can probably tell you everything about maid culture, I am not going to be going to one any time soon. But these were desperate times, and I seriously needed food at a somewhat reasonable price. So I made my way to the cafe as my last resort. Well, it turns out I had much more to worry about than my shyness, like just getting my damn food in the first place. The maid cafe was packed and had a long line waiting outside of it. So they decided to cut down the line by fitting as many parties as possible into big tables of up to six people. So I sat with a pair of teenage guys cosplaying as Pokémon characters and a pair of young Asian girls. Three sets of complete strangers, all eating at one large table together, awkwardly not talking to each other. Our maid for the evening, Yumie, was not only taking care of our table of six, but also had to take on the table of six next to us and probably other tables somewhere else. She was in charge of taking our orders and keeping us entertained with her company. However, with over a dozen people to serve, that wasn’t quite so easy. The girl seemed to have no idea what any of the food items were. She mixed up the food between the two tables and completely forgot to give us eating utensils. The Pokémon boys paid a little extra to play a board game with her, but she was so busy working the other tables that she had to play one round at a time before running off. So she wasn’t the best waitress. That’s okay, that’s not her job, However, the restaurant they had rented out for the cafe had actual waiters and cooks on staff to take care of the food. The real waiters were supposed to take the orders from the maids, and then pass off the food to the maid to deliver to the table. Well, the problem is that Yumie was NEVER AROUND for the real waiters to pass off the food to us. As I was starving, I could see my food waiting there in the hands of an actual waiter, who was gradually looking more annoyed and impatient as our maid was no where to be seen. What was wrong with this picture? Where was our maid, and just why did she have to be there to deliver the food that was sitting right next to us? By the time Yumie came back and actually delivered our food, I quickly ate it, plucked down my 10 bucks, and got the hell out of there. I wasn’t sticking around for dessert. 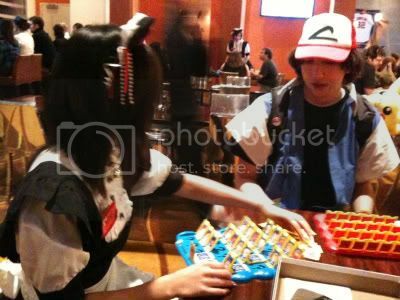 The maid cafe was a mess, and it was just one example of how the Katsucon staff did not have their act together that weekend. This disorganization also became evident on how poorly the panels went. No one was there to tell the panelists when to stop talking, so many of the guests ran overtime. When a line formed outside of a room for an upcoming panel, there was nobody on staff there to clear out the room and let in the new people. It was up to the attendees to adhere to this unspoken convention rule, and a lot of the times, they just ignored it. And not to sound like an old geezer, but I also noticed a heavy use of alcohol on the convention grounds during the evening, way more than I have ever experienced at a convention before. So many kids were walking around completely plastered, causing a ruckus in the hallways and on the elevators. Where was the security? Where was the crowd control? There was more booze flowing around the Gaylord that weekend than a college frat house on a Thursday night. I really hate being negative in these reports, but it’s honestly hard to figure out what positive things I could say about my first time going to Katsucon. I really did enjoy the coat check service, but even that failed me on the last day. The guest interview process was a little disorganized, but I was eventually able to arrange for my requested interview. But that is as far as the pleasantries go as there was not much all that notable about this convention. There were only a few panels that I enjoyed going to, and I have already written about most of them earlier this week. The bitter truth is that I spent most of the time walking around, bored, hungry, and looking for something to do, so I really did not enjoy my time down there at all. Now granted, there were many factors working against the convention and its staff. It was a new location this year and they were dealing with the blizzard that occurred just a few days earlier. But there really is no excuse for a poorly organized convention like this, not when you have a fan-driven show like Otakon run so smoothly year after year. So hopefully this was just bad circumstances that ruined the Katsucon experience for me this year. By hiring more staff, keeping the con running much smoothly, and providing better eating options for the poor kids in attendance, I’m sure that they can greatly improve the situation for Katsucon 17 next year. But I highly doubt I will be back again to see it. Top photo provided by Janai Blog. This entry was posted on Friday, February 19th, 2010 at 8:06 pm by Scott	.